Oh, the internet. The social sphere and shopping mall of the modern world, where Christian brothers and sisters can go to…spew snark, sarcasm, snide comments, and condescension at each other. Isn’t it great? No, it isn’t, because our hearts are wicked. And from the wicked fullness of our hearts, our thumbs tweet. We are all guilty, to varying degrees. Permit me for a short while to express where I am coming from, and where I think many others are coming from, as a Particular Baptist (adherent to the 1677 2LCF), often called a Reformed Baptist, interacting regularly online with those in the Reformed denominations on various issues. I would like to appeal to my Presbyterian and Reformed brothers and sisters to acknowledge that 2LCF (1677) and those who confess it belong in the diversity of the Reformed Family Tree. 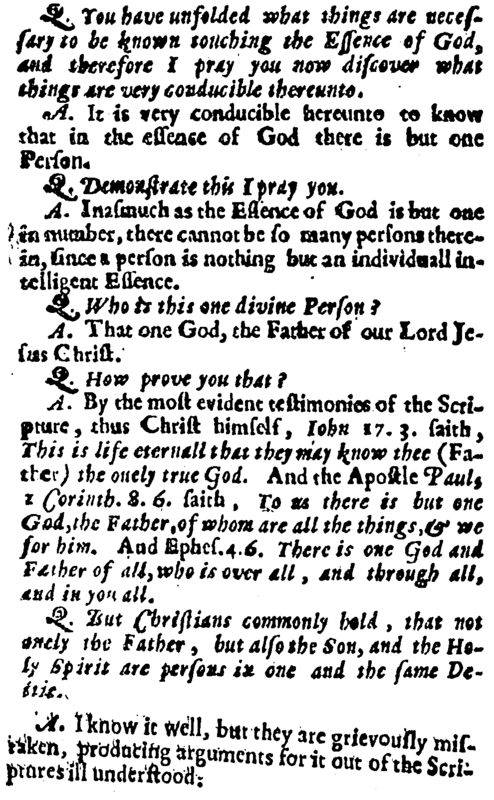 Accept, for the sake of reading this charitably, that the seventeenth-century Particular Baptists of 2LCF (1677) share a historical and theological heritage with the Reformed churches, and that their use of the Savoy Declaration and the Westminster Confession to edit/compose 2LCF was sincere. If you accept this, then those who embrace 2LCF in modern times will view the modern Independents as their elder brother (alas, I don’t know any), and the Presbyterians as their eldest brother. If you accept the previous, how will modern Particular Baptists respond to Presbyterian and Reformed brethren who often (in my experience) dismiss and distance the 2LCF Baptists? To the Particular Baptist, it feels like condescension, ignorance, and unnecessary unkindness from our closest theological relatives. Oh no! Our feelings! Yes, our feelings. The internet may be a virtual reality, but it is a reality. It is the modern social sphere where real people interact with real people, where real Christians spend real time with real Christians through a virtual medium. So, these things do matter. And we should do everything, whether in word or deed, in the name of our Lord Jesus (Colossians 3:17). The virtual nature of the internet doesn’t exempt us from guarding our words (which are actions). Perhaps in this post we can gain some clarity and direction for better interacting with each other as Particular (Reformed) Baptists and Presbyterian and Reformed brothers and sisters in Christ. We do not want all Presbyterian and Reformed persons to forfeit their views and convert to 2LCF 1677 views. When Particular Baptists want to be acknowledged as a branch of the Reformed family tree, it is not a desire to combine all the branches into one trunk. It is not a desire for the Presbyterian and Reformed brethren to say “You are exactly the same thing as we are.” We want our place among the diversity already present in their midst to be recognized. We do not want all Presbyterian and Reformed persons to cease criticizing or challenging baptistic theology. Christian brotherhood should involve iron-sharpening and mutual edification. Addressing errors can be done charitably and winsomely. We want Presbyterian and Reformed persons to realize who 2LCF Baptists are. They are the modern confessors of 2LCF. That is painfully obvious, but what I mean is that many Baptist churches confess 2LCF without any changes from its original publication. You could walk into a Particular Baptist church in 1689 or 2019, 330 years later, and you should get the same theology. This matters because one of the ways in which our Reformed brethren are dismissive of us is to lump 2LCF Baptists into the generic common criticisms of Baptists. It is unhelpful and misguided. We want Presbyterian and Reformed persons to acknowledge the historical and theological roots of the Particular Baptists. Historically, Particular Baptists emerged from the collision of Reformed theology with the Church of England in the early seventeenth century, the same as Ball, Burgess, or Marshall. It is historically and factually wrong to locate the Particular Baptists’ origins among the continental Anabaptists. See this post. Theologically, the Particular Baptists intentionally and sincerely employed Reformed theology to edit/compose 1LCF (1644) and 2LCF (1677). See this work. Read this book. P&R Response: 1LCF and 2LCF may incorporate Reformed theology, and that at a high percentage. But, the deviations are sufficient to invalidate the category “Reformed” being applied to the finished product. Particular Baptist Response: But in the context of 1646 WCF and 1677 2LCF, let us consider the “deviations”: Church government, liberty of conscience, role of civil magistrate, subjects of baptism, and mode of baptism. To begin, the modern WCF reduces these differences down to church government, subjects of baptism, and mode of baptism. So, the P&R brethren must recognize that since 1646, they have moved closer to us (at least in the case of Westminster Presbyterians). Now that the differences reside in ecclesiology and baptism, let it be remembered that the Dissenting Brethren and some Continental churches practiced Congregationalism, and are just as much a part of the Reformed Tradition by most judgments. See this book and its two reviewers. So, now the boundaries of our shared Reformed heritage are only divided by the subjects and mode of baptism. But isn’t that precisely what the label “Reformed Baptist” implies? Ultimately, what is desired here is to acknowledge roots, origin, and provenance. One may think that the Particular Baptists went too far (and again, the only criteria left for modern Presbyterians are the subjects and mode of baptism), but where they came from should be acknowledged. It is common for P&R Christians to argue that Baptism is God’s word to us, in opposition to the “Baptist” idea that it is our profession to God. This is convenient for upholding infant baptism. But it is not accurate, as far as historical theology is concerned. Baptism is not just God’s word to us, but also our word to God and the world (and I emphatically agree that it is both, and Baptists who limit it to one side are liable to criticism just as much as paedobaptists who limit it to the other side). John Calvin: A sacrament is “a testimony of God’s favor towards us confirmed by an outward sign, with a mutual testifying of our godliness toward him.” [The Institvtion of Christian Religion, IV. 13. 1. Cf. also IV. 13. 13-14.] In fact, Calvin says that a sacrament is commonly known as a pledge sworn by a soldier to his captain, and therefore the burden of proof lies on showing that a sacrament is not just our word to our Superior, but a word from our Superior to us. Related to the previous, the Westminster Assembly voted that A profession of faith is necessary for baptism. Paedobaptists do not agree on Whether the promises of the covenant of grace are definite or indefinite to the children of believers. Owen and others believed that children have a right to the public profession of baptism by virtue of being the children of believers, but cannot join the church as members until they make their own profession of faith. If Owen and the Independents are not cut out of the “Reformed” label for this, then it too must be jettisoned when dealing with Particular or Reformed Baptists. The previous points are important because most modern-day Presbyterian and Reformed persons that I know (thinking of the OPC, PCA, and URC here) reject or neglect various of these diverse views. Their children are not necessarily regenerate by virtue of being the children of believers. Their children need to be evangelized. Their children are holy in a general sense, meaning simply that they belong to the church outwardly. At that point, the only difference between the Reformed Baptist’s children, and the Presbyterian’s children is that the children of the one were baptized, and the children of the other were not. Both will be catechized and evangelized. We want Presbyterian and Reformed persons to read charitably the literature of the Particular Baptist tradition and its historiography, not just John Gill and Charles Spurgeon. I’ll be the first to say that there is a great deal of Baptist literature that is so overwhelmingly and obnoxiously Baptist that even I don’t want to read it. So, here I am not talking such books, but about serious scholarly thoughtful, and yet intentionally Baptist, literature. We want P&R brethren who dismiss or distance 2LCF Baptists in the context of discussing shared heritage and identity to acknowledge the extent to which they do not reflect the heritage that they claim for themselves. Many of the theological reasons for which their Presbyterian forefathers disliked the Particular Baptists have been rejected by the modern Presbyterian sons. And we are not discussing fringe views from individual divines. 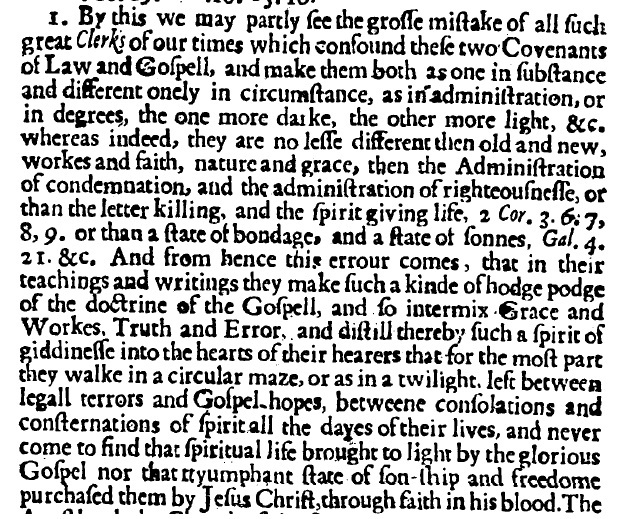 We are talking about the settled beliefs of the 1646 Westminster Confession of Faith before Parliament removed some of its potency. Speaking for myself, because the internet is a social sphere I want to be able to “spend time” with P&R brethren, i.e., occupy the same digital spaces, without being told regularly, but wrongly, that I am something worlds apart from the P&R heritage, and being treated as such. You be you. I’ll be me. And we’ll be a happy Reformed family. More importantly, I want to be able to defend and protect, mutually, our shared heritage. Within the modern Reformed world, there are serious theological threats to the biblical, classical, confessional Reformed heritage–especially on the doctrine of God. Personal connections, networking, and the dispersal of ideas through social media can be a useful tool (supplemental to scholarly work in seminaries and pastoral fidelity in pulpits and presbyteries) to lock arms and hold the line. Make no mistake. Baptists themselves have their own part to play in this. For every instance of condescension on the part of a P&R Christian, there is an instance of some similar, or other, extreme on the part of a Baptist Christian. This is a two-sided, two-party, problem. We would do well to learn from the Appendix to the 2LCF. In closing, imagine a tree-fort, a really great and wonderful tree-fort. Imagine an elder brother, we’ll pick a random name for him–Presbyterian. Imagine a younger brother, we’ll pick a random name for him, too–Particular Baptist. Imagine that Presbyterian is playing in the family tree-fort and every time Particular Baptist wants to come up and play, Presbyterian pulls the ladder up. This isn’t kind. Presbyterian says, “Go away, you don’t belong here.” Particular Baptist says “It’s the family tree-fort! I want to play, too!” Presbyterian refuses to provide the ladder, so Particular Baptist goes looking for the middle brother, let’s call him…John Owen. But he’s nowhere to be found, so Particular Baptist just gets cranky and annoying, while Presbyterian smugly enjoys the tree-fort. When contending that Reformed theology, in the context of early seventeenth-century Puritanism, is the most significant influence on Particular Baptist origins and theology, this question naturally arises: If the Particular Baptists were so similar to the Reformed tradition, why is it that those in the Reformed tradition viewed the early Particular Baptists as something so different? Given that the Particular Baptists emerged just before and during the time of the Westminster Assembly, how did the Westminster divines view the Particular Baptists and what did they say about them? To answer these questions, we need to ensure that we understand as much as possible the context in which the Westminster divines were introduced to, and responded to, the Particular Baptists. First, you believe that in matters of religion, the civil magistrate has the right to compel the conscience. Second, you believe that the civil magistrate is responsible to enable the true church to exist and to disable all opposition. Third, you believe that this national uniform church should include a form of hierarchical government. Fourth, you have been commissioned by Parliament to begin this process. A Particular Baptist (though you would not know him by that name) believes that the conscience cannot be forced in matters of religion, that the civil magistrate has no right whatsoever to establish, enable, or enforce a national church, and that all authority and power for the government of churches resides in the churches themselves, subject to no higher power as a church power. If the Particular Baptist is right about this, the Westminster Assembly’s very existence and purpose are invalidated. If this were not enough, there are some in England who are apparently baptizing themselves, forming their own congregations, ordaining their own officers, and publishing literature advocating their positions while criticizing yours on these points. Their existence is antithetical to yours, to the church you envision, and to the mission your government has given to you. And now, some of the university men and clergy are joining them! This Anabaptism must be stopped. The Westminster Assembly sent a recommendation to Parliament in Aug-Sep of 1644 advising legislation for the suppression of Anabaptism. The Assembly sent out a call for Anabaptists to submit their reasons against infant baptism to the Assembly. The next month, October, the Particular Baptists published their first Confession of Faith. So, apparently a group of Anabaptists that say that they are not Anabaptists, but also don’t mind telling us (the Westminster Assembly) that we are somewhat conceited, have published a Confession of Faith. What do they believe? Who are these people? Listen to the divines responding to the 1644 1LCF. I acknowledge it the most Orthodox of any Anabaptists confession that ever I read, (although there are sundry Heterodox opinions in it) and such an one as I believe thousands of our new Anabaptists will be far from owning. So, in Stephen Marshall’s opinion most Anabaptists would never come close to calling this confession their own. To the contrary, it’s the most orthodox Baptist theology he’s read. But it has unorthodox opinions. Tell the English Anabaptists now of the Doctrine and practice of their fathers in Munster and elsewhere, they are ready with passion to deny all affinity, all consanguinity with such monstrous Heretics…the furthest they will profess to maintain is but a simple antipaedobaptism…We wish that all our questions with that generation of men were come to so narrow an issue; we are [reluctant] to force upon any man the errors which he is willing to disallow. We wish that all these who go under the name of Anabaptists in England, were resolved to stand to the Articles of that confession without any further progress in error. In Baillie’s mind, the only connection to the Anabaptists that the Baptists of this Confession will acknowledge is that they both reject paedobaptism. And he wishes that the scope of their disagreement was so limited with all Baptists. When credobaptism is placed within the context of 1640s England, one can appreciate the dilemma to which Baillie alludes. He says that they do not wish to attribute errors to those who deny them. He is looking at a Baptist confession full of Reformed theology, and yet coming from a group whose distinctives are antithetical to a Westminster Presbyterian. If they say that they aren’t Anabaptists, but they’re opposite to Presbyterians in key ways, what are they? It was easy to continue calling them Anabaptists. It was a lazy label, even a label that Marshall and Baillie acknowledged didn’t quite fit, but ultimately it was a convenient label for use by a government-backed ecclesiastical structure because it created instant marginalization and exclusion. We have seen several contextual historical and theological reasons for why the 1640s Presbyterians viewed the Particular Baptists as so different from themselves. What we must be careful to do is to read the Presbyterian reception of Particular Baptists through their own lenses. But the difficulty is that modern Presbyterians are so different today. Few of them hold the original views on liberty/compulsion of conscience and the role of the civil magistrate in the same. Ironically, this means that many modern Presbyterians are at odds with key features of their own tradition because as noted above, if the state cannot and should not establish national religion, the Westminster Assembly should never have been called for the purpose that it was called. Strangely, the American Westminster Confession essentially invalidates the reasons for the existence of the original Westminster Confession. In conclusion, the purpose of this post was to address the question: If the Particular Baptists were so similar to the Reformed tradition, why is it that those in the Reformed tradition viewed the early Particular Baptists as something so different? We have seen Westminster divines remarking on the orthodoxy of 1LCF. We have also seen them dismissing it in the context of a uniform national state church which is utterly opposed to Baptist congregationalism. And we have noted that appropriating 1640s responses to the Particular Baptists in a modern context is strange and difficult given that the premises of the 1640s Presbyterians’ criticisms are no longer shared by modern Presbyterians. This should caution us all to make sure we understand the contextual motivation and argumentation of older sources, especially if we want to apply those sources to modern contexts. *Meaning not that there has never been an edited version of 2LCF, but that its modern inheritors confess it in its pristine originality. In the seventeenth-century polemics of paedobaptism and credobaptism, one of the common arguments asserted by the English Particular Baptists was that their paedobaptist brothers agreed that a profession of faith was a necessary prerequisite for baptism. 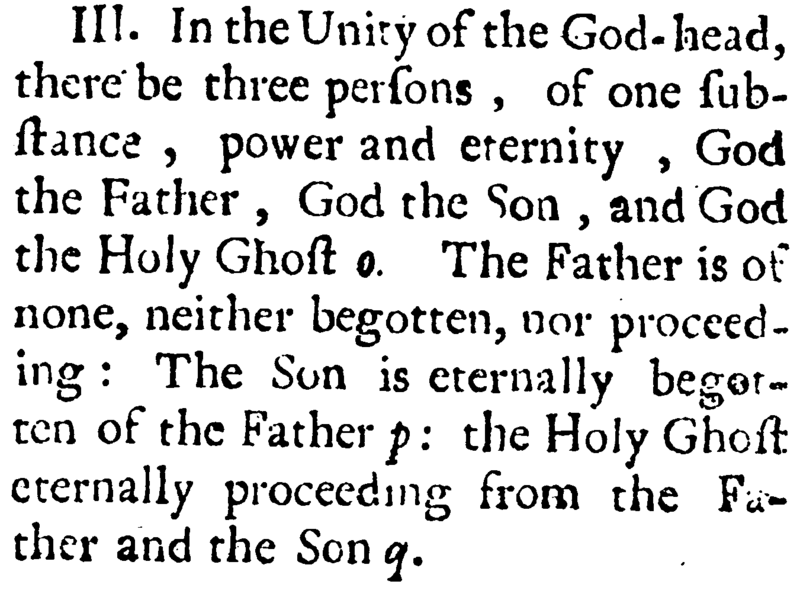 To make their point, Particular Baptists like Andrew Ritor, Benjamin Coxe, William Kiffin, Hanserd Knollys, and Thomas Patient appealed to the catechism of the Church of England, which was appended to the Book of Common Prayer. 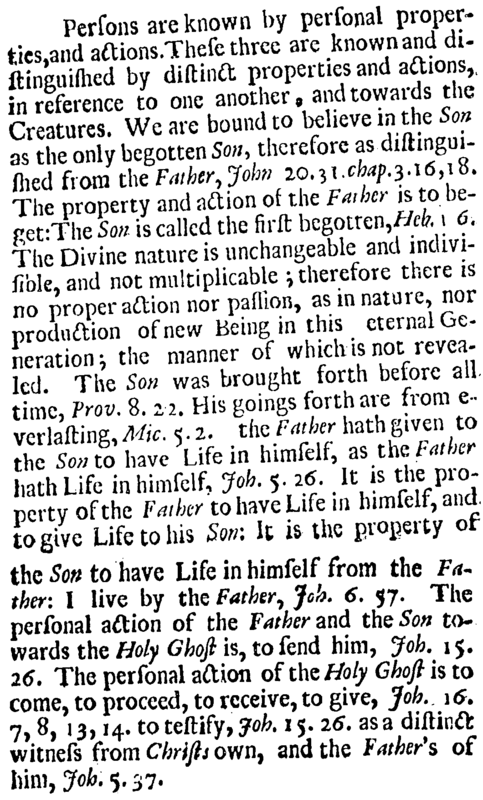 The catechism specifically required a profession of faith and repentance before admission to baptism. The Particular Baptists viewed this as inconsistent credobaptism, or perhaps we could call it “credopaedobaptism.” If actual repentance and faith were necessary, how could these be promised by parents or godparents? Given their strong Calvinism, the idea of promising actual faith and repentance (which could only be given by God) for another was an absurdity. To the Particular Baptists, this presupposed the election and thus salvation of children, many of which were not saved. If the children were presupposed as elect, then salvation could be lost. If the children were not presupposed as elect, then there could be no presupposition of God-given repentance and faith in them. 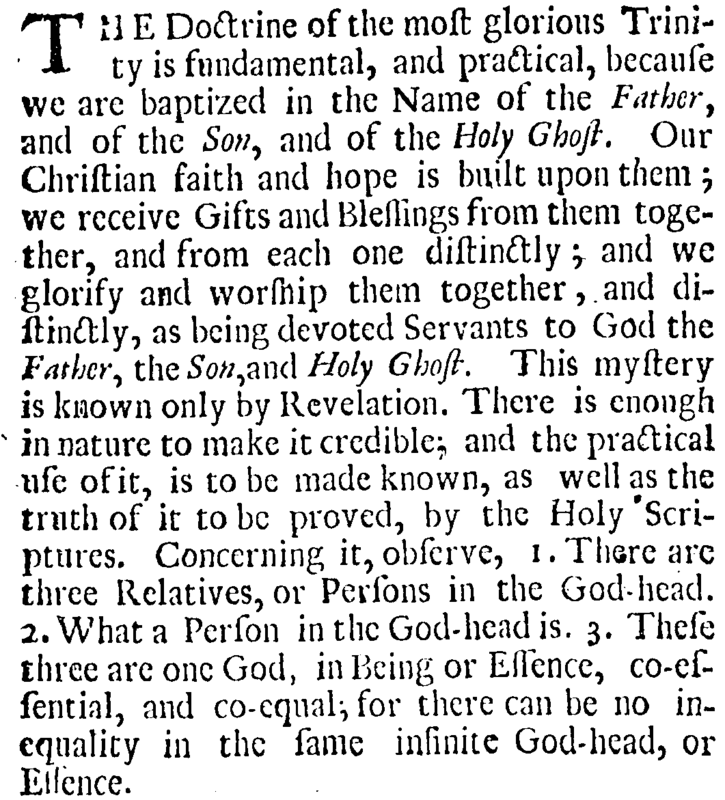 When the Westminster Assembly began its work reforming the Church of England in order to impose national uniformity through a new Confession of Faith, Catechism, and Directory for Public Worship (with a few more documents), they inherited the unlucky task of wrestling with the question of a profession of faith in baptism. George Gillespie’s Notes of Debates and Proceedings of the Westminster Assembly give us a glimpse into how the Assembly handled it. Read below and decide for yourself if their conclusions about credopaedobaptism were satisfactory. These thoughts are directed primarily at members in the OPC and PCA. The view that the Mosaic covenant was a covenant of works is a view found among Reformed divines in the 17th and 16th centuries. 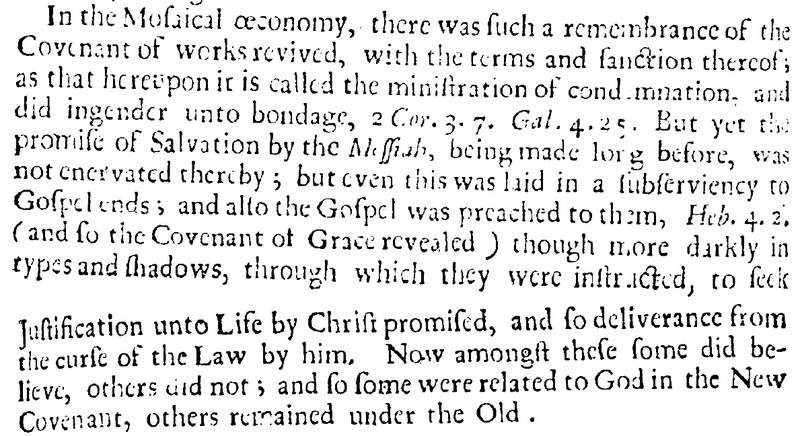 The Westminster Confession of Faith is not the exclusive expression or boundary of Reformed orthodoxy. The fact that a given divine at the Westminster Assembly held to a given view does not mean that the Confession itself either reflects, includes, or accounts for their view. They debated many things. The conclusion of the debates was a majority vote in one direction, not a unanimous vote. A covenant of works and a covenant of grace are as different as wood and stone. They are different “substances.” If the Mosaic covenant is a formal covenant of works (not just containing a remembrance of Adam’s covenant) it cannot be the covenant grace. See John Ball, A Treatise of the Covenant of Grace (London: Printed by G. Miller, 1645), 93-95. Ball is discussing John Cameron’s view that the Mosaic covenant (the old covenant) is neither the covenant of works nor the covenant of grace but a legal covenant for the nation of Israel to live life in the land of Canaan. Ball concludes that this view makes the old covenant differ from the new in substance. 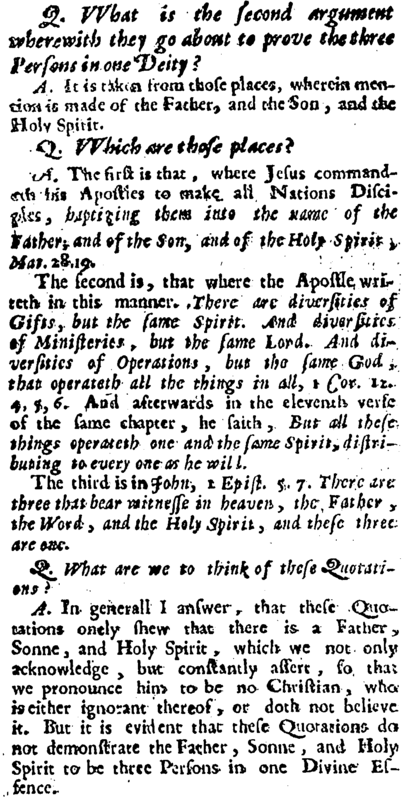 See also John Owen, A Continuation of the Exposition of the Epistle of Paul the Apostle to the Hebrews (London: Printed for Nathaniel Ponder, 1680), 324-42. Owen considers the majority view as expressed in the WCF and rejects it because he views the Mosaic covenant as a works covenant for life in the land. This is the result of the simple logic of substance as applied to covenant theology. How your church uses the Westminster Confession of Faith may be quite different from its original intent and design. Whereas its original function may have permitted the flavors of Reformed theology to coexist, the function that your church is assigning to it may not. You have to deal with that. If you are another “flavor” than the WCF but your view was found among the Westminster divines or Reformed theology in general, that still does not mean that your church’s use of the WCF permits you within its boundaries. You’re probably not using the term “administration” correctly or accurately. Think about that for a moment. There is only one divine essence. Thus, three divine subsistences must all share one divine essence. How can one essence be distinguished into three subsistences but not divided? It is infinite. The essence of God is deity. The essence of man is humanity. Human nature is finite, thus no one else can subsist within my essence. I may share a common essence with humanity, but it is a divided, individual, and separated essence. A substance is an essence in existence, thus each human being is a different and separate substance sharing the common essence of humanity. But there is one divine essence and thus one divine substance, in which godhead the three persons of the trinity subsist. 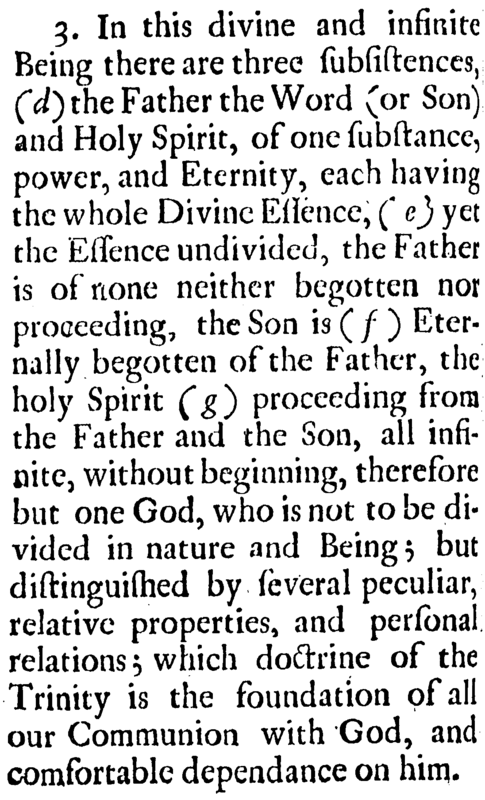 This makes “subsistence” the perfect word for expressing the technical unity and trinity of God because it necessarily connects to a given essence, in this case the singular and unique essence of deity. “Person” carries with it the linguistic baggage of human personhood connected to human essence. Without proper definition, “person” can be easily misused. Trinitarian personhood is not human personhood. 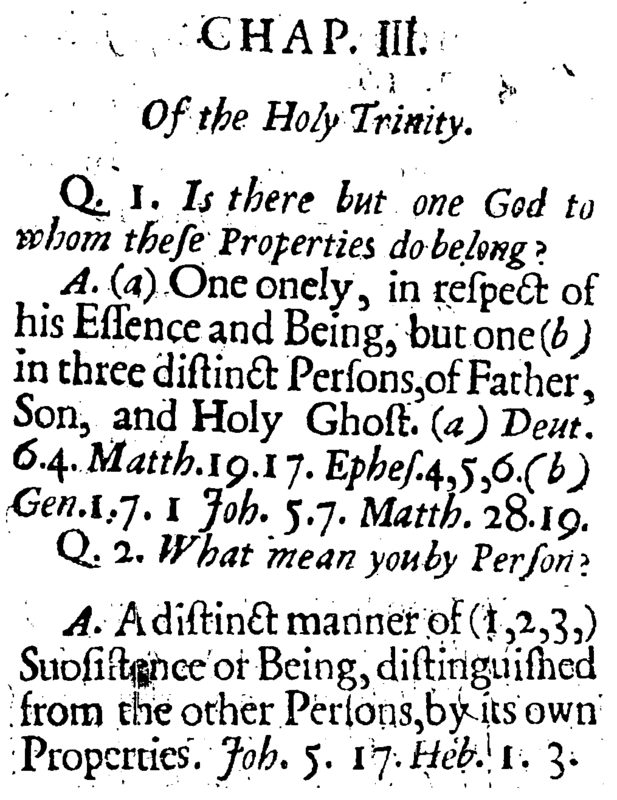 That being said, the WCF is in no way heterodox on the trinity. 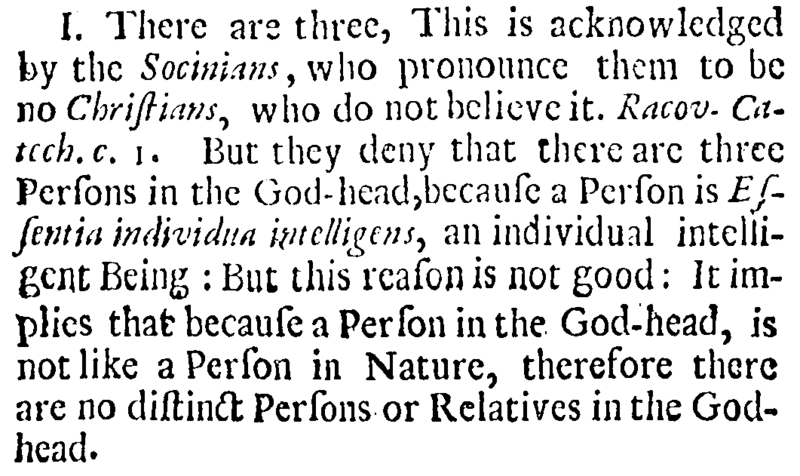 The term “person” is perfectly capable of carrying these theological distinctions. One must simply be careful. Consider the discussion of this anonymous writer. He begins by saying that the doctrine of the Trinity is practical to us because it helps us to know the one God that we love, worship, and serve. Next he warns us of the need for precision because the Socinians (in their Racovian Catechism, see end of post) claimed that God was one person. Their fundamental flaw was to equate human personhood with divine personhood. Persons are distinguished by personal relations and peculiar relative properties, as the LCF above made clear. 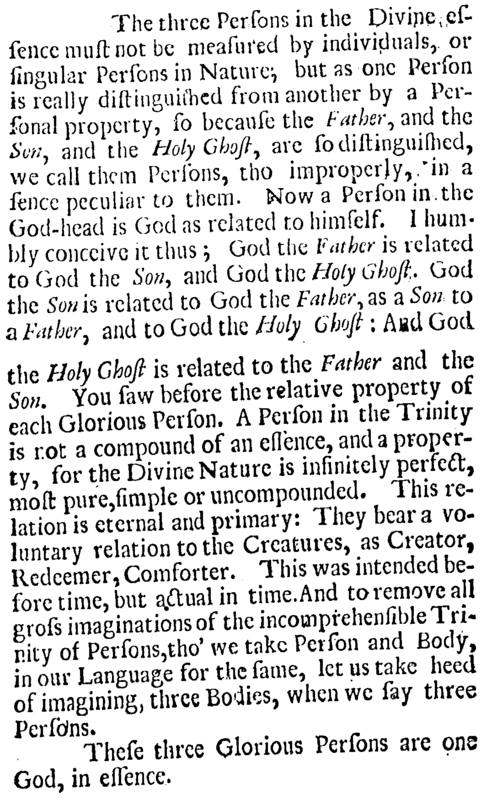 Notice how in the midst of this he reminds the reader that “the divine nature is unchangeable and indivisible, and not multiplicable; therefore there is no proper action nor passion, as in nature, nor production of new being.” In other words, the eternal generation of the Son never “happened” because God is not bound by time, thus nothing can “happen” to him, i.e. no passion. He is pure being, no becoming. Thus the Son’s generation is eternal in the sense that it is atemporal. Were God bound by time, he would be changeable. Were the Son brought forth from the Father as we conceive of generation, then the nature of God would be both divisible, multiplicable, active, and passive in time (which it is not – he has no parts or passions). Next he explains where we get the term “person” from and why we use it, acknowledging that there may be better ways to express the concepts. Once again he reminds the reader to separate ideas of human personhood from divine personhood. God is altogether other than we are. The language we use is “improper,” that is, it does not fully describe, though it does truthfully describe, who and what God is. In light of all of these careful nuances and important distinctions, we can safely conclude that while there is no doctrinal disagreement or difference between the two confessions, the LCF displays a careful desire for further technicality and precision and thus employs the term “subsistence” rather than person. To add a little more to the previous post on formal and material republication, let me fill out how the distinction between form and matter works on a larger scale. When it comes to justification, the material basis of a covenant is either law or promise. Works/law and grace/promise do not intermingle. If two parties are committed to each other based on a law, a covenant of works has been established. If two parties are committed to each other based on a promise, a covenant of grace has been established. The matter dictates the form. In light of this distinction, just because the law is present in a given covenant, it does not mean that this covenant is the covenant of works. Conversely, just because the promise (the gospel) is present in a given covenant, it does not mean that this covenant is the covenant of grace. 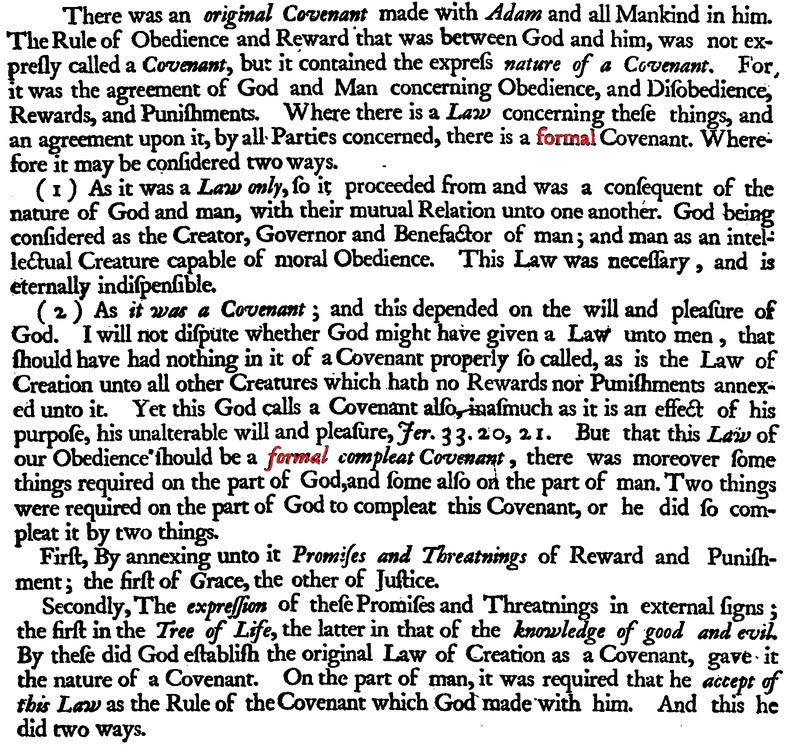 James Durham demonstrates the difference between a law, and a law used to established a covenant of works. 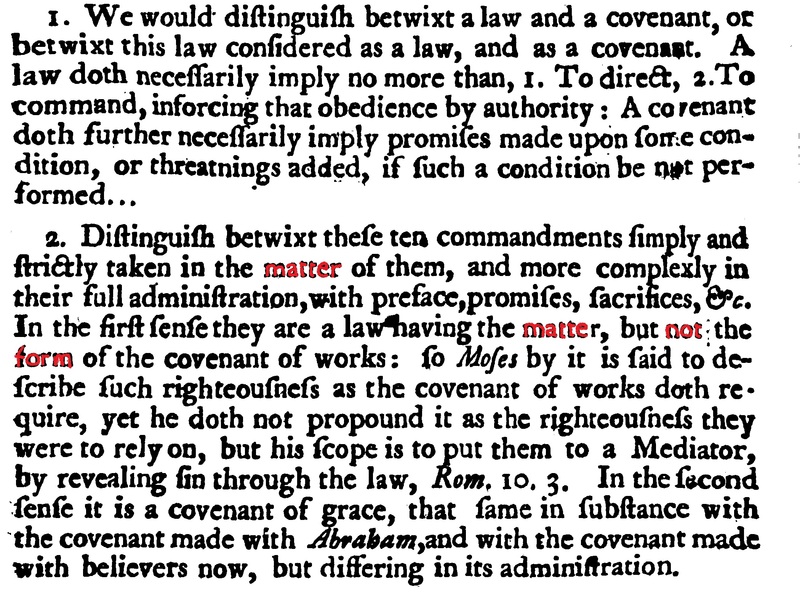 In this line of thinking, Obadiah Sedgwick argues that although the law was present in the Mosaic covenant, it was not a formal covenant of works. This is material republication (as was Durham above). This also applies to believers. In the Marrow of Modern Divinity, Edward Fisher wanted to protect the idea that although the law came to believers, it did not come as a covenant of works. Legalism is inevitable if we are convinced that the law necessarily entails a covenant of works. Now, how did this play out in Particular Baptist theology? John Owen will be our theologian. 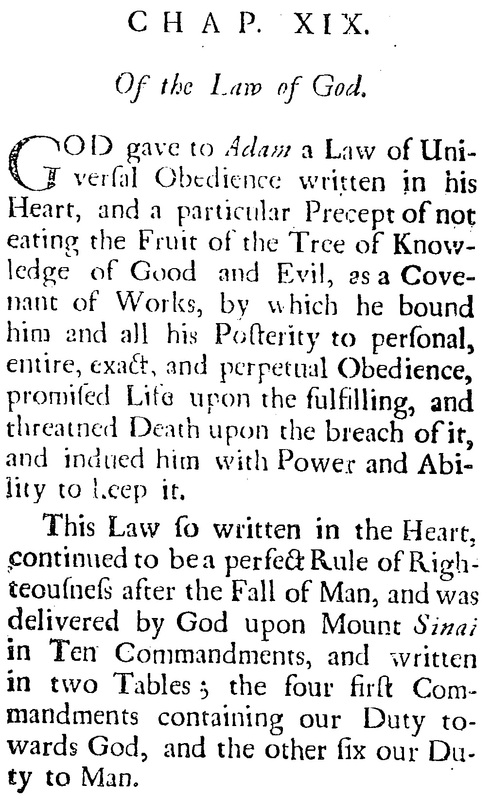 Nehemiah Coxe considered Owen’s work on Hebrews to be representative of his own views on covenant theology. First, Owen is operating within the same ideas and makes the same points made above, that we have to distinguish between the law on its own and the law as a covenant. The same is true for the promise of the gospel. Just because the promise of the gospel is present from Genesis 3:15 onward, it does not follow that the covenants wherein it appears are the covenant of grace. 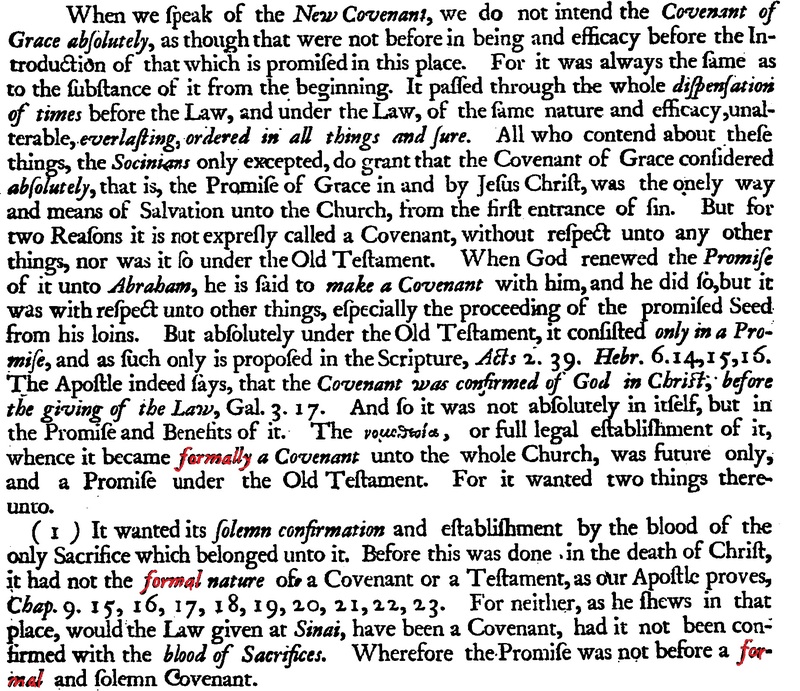 Owen argues that the covenant of grace was only a promise until its formal establishment in the new covenant. The elect were saved by virtue of the covenant of grace (the promise of the gospel) in all the ages, but it was not formally established until Christ’s death. The same point is made again, showing how the New Covenant could not be new if it had already been formally established. The law and the gospel (the promise) are present in the Abrahamic, Mosaic, Davidic, and new covenants. Westminster paedobaptists will argue that all of these covenants were established on the promise of the gospel and thus were covenants of grace, or rather a twofold administration of the covenant of grace. The law played the same role in all of them, namely as a rule of righteousness (more burdensome in the OT). None of those covenants were covenants of works. Particular Baptists will argue that although the promise of the gospel was present and revealed in all of the OT covenants, they were not the covenant of grace. The old covenant saved no one because it was a covenant of works for life in Canaan. Until the New Covenant was formally established in Christ’s blood, the covenant of grace existed in promise form only. The new covenant is truly new, the fulfillment of everything promised and hoped for in redemptive history. No covenant was formally established on the promise “I will remember your sins no more” until the blood of Christ inaugurated the new covenant. In debates concerning the republication of the covenant of works within the Mosaic covenant, anyone who holds to the Westminster Confession or the London Baptist Confession confesses that the same law that was given to Adam was delivered to Moses. At the very least, then, the confessions teach a republication of the law of the covenant of works. Where things get more complicated is when we discuss how that law functioned. Was the law given to Moses as a covenant of works? That is a much larger statement than simply that the same law given to Adam was given to Moses. To help understand how this issue works, we need to understand how the distinction between form and matter was applied to covenant theology. 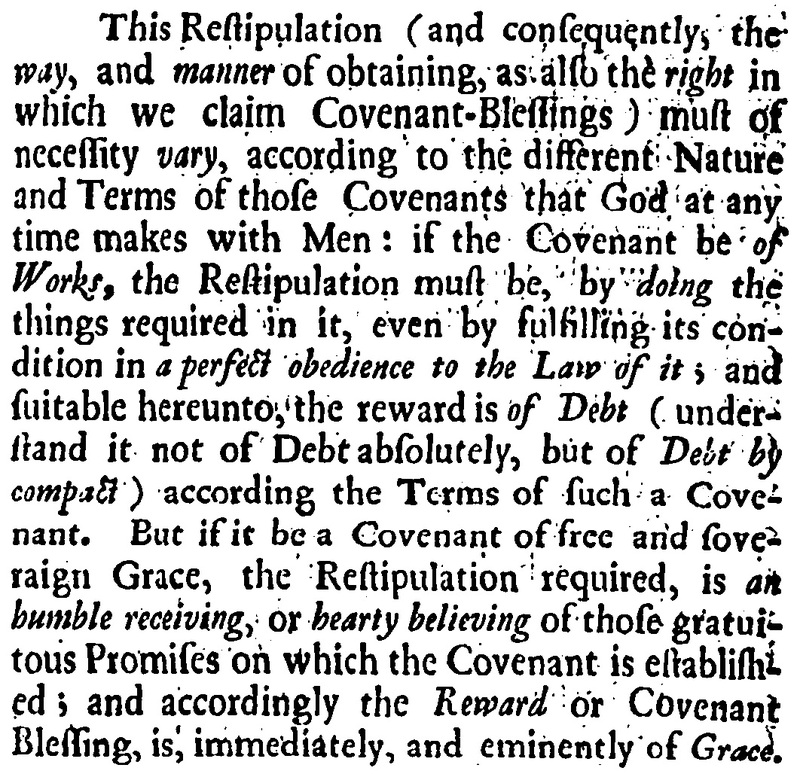 The formal nature of a covenant depended on its material basis. Think of matter and form. If you make something from clay (a kind of matter), then you will get a clay object (a form). Likewise for wood or stone. Different materials produce different forms. A union of form and matter is a substance. In covenant theology, if a covenant was established on the basis of law, the covenant was a covenant of works. If a covenant was established on promise, the covenant was a covenant of grace. The covenant partner would respond accordingly, with obedience to the law and reception/belief of the promise. Nehemiah Coxe shows this difference. Law and promise are contradistinguished matters that produce contradistinguished forms. Because a union of form and matter is a substance, covenants that differ in substance are covenants that differ in form and matter. This is a complicated way of saying that a covenant of works and a covenant of grace are two different things. A covenant of works is built on law. A covenant of grace is built on promises. They differ in matter, form, and thus substance. Any formal covenant of works cannot be a covenant of grace. In light of this, some have spoken of material republication and formal republication. Material republication indicates that the matter of the covenant of works, i.e. the law, was delivered to Moses. Both confessions confess this. Formal republication indicates that not only was the matter of the covenant of works delivered to Moses, but it was also the basis upon which Moses’ covenant was established. Thus the law was materially and formally republished, meaning that the Mosaic covenant was a covenant of works. With all of this in mind, there is a significant difference between the Westminster Confession and its sister documents, the Savoy Declaration and the London Baptist Confession. 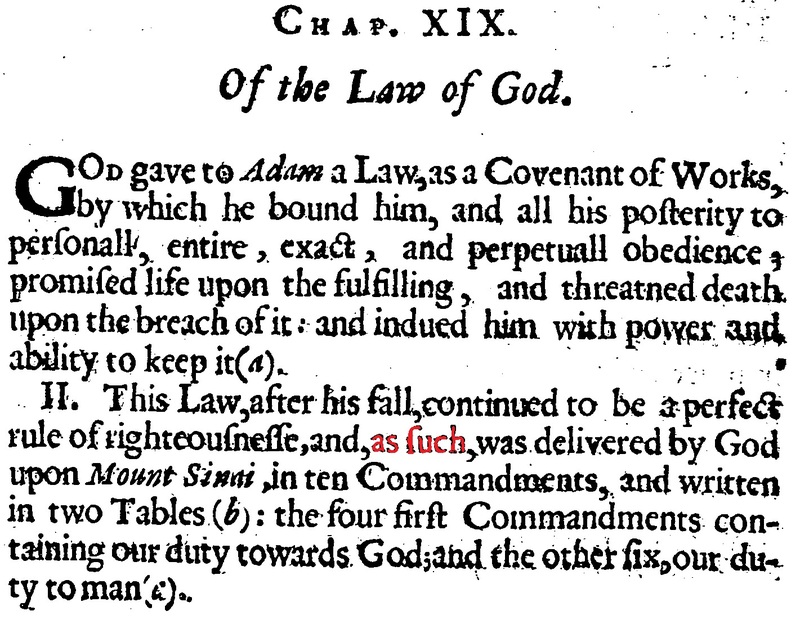 Notice the red text above: “as such.” This limits the nature of the function of the law as it was given to Moses. It was given to Moses “as a rule of righteousness“. Formal republication is of course built on material republication. But material republication, i.e. the presence of the law in the Mosaic covenant, does not necessarily entail formal republication. Just because the law is there, it doesn’t mean that the law is functioning as a covenant of works. The Westminster Confession does not go beyond material republication to formal republication. In fact, this clause “as such” specifically limits the role of the law delivered to Moses to a “rule of righteousness.” This is very consistent with the view that the Mosaic covenant is a covenant of grace (as WCF confesses). God redeemed Israel and gave them the law as the path for their grateful obedience. 2. We already mentioned the second reason for the change in the confession, namely that the Particular Baptists believed that the law was delivered to Moses, not just as a material republication of the universal moral law of righteousness to which all men are obligated, but also as a the basis for a formal covenant of works. Clarification needs to be added here that different Particular Baptists took this in somewhat different directions. Some confined the Mosaic covenant of works to temporal life in Canaan, meaning that the Mosaic Covenant did not offer eternal life. Others, however, spoke of the Mosaic covenant as being the original covenant of works itself delivered to Israel. In conclusion, I want to make a few brief points. 1. Regarding the London Baptist Confession, the deletion of the phrase “as such” is not so much a positive affirmation of formal republication as it is an opening of the door wide open for it. Chapter 19 is not about the Mosaic covenant; it’s about the law. So the London Baptist Confession’s removal of the phrase “as such” is simply a refusal to restrict the giving of the law to Moses to a rule of righteousness. 2. Conversely, the WCF does not allow for formal republication. Why did so many Westminster Divines hold views beyond material republication, then? We have to remember the context of the Westminster Confession. It was a government-ordered project. It was designed to be a public standard of preaching and teaching, not to be contradicted. It was not designed for some of the subscriptional standards used by Presbyterian denominations today. To argue that since certain divines held to formal republication (or other variants thereof), the confession must allow for those views, is anachronistic. They held contradictory views, but were not to publicly contradict the confession. In an age of ever-shifting government and an ever-shifting state church, one must be careful to take the context into account. In England, the WCF as we know it did not have the impact that it had in Scotland because its final approved form had to please an Independent-controlled Parliament. The answer to the diversity of the views of the divines is not necessarily that “they must all fit within the confession because it was a consensus document.” This is especially true when many Westminster divines would gladly use the magistrate to punish those whom they deemed heretics (as they did). The London Baptist confession assigns the promotion of peace and justice as well as lawful war-waging to the civil magistrate. But the Westminster Confession assigned further powers of suppressing blasphemies, heresies, and reforming the worship of the church. Keep that in mind. 3. Behind all of this is the Subservient Covenant, from John Cameron to Samuel Bolton to John Owen to the Particular Baptists. But that’s another story (and perhaps a dissertation…).